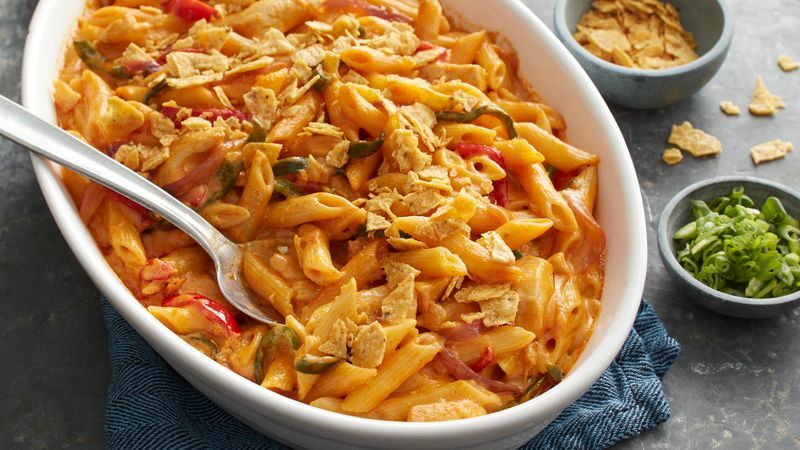 Check out this Macaroni and Cheese full of fajita flavor and plenty of cheese. 1 Heat oven to 350°F. Spray 13×9-inch (3-quart) glass baking dish with cooking spray. Cook and drain pasta as directed on package. 2 Meanwhile, in a Dutch oven, heat oil over medium-high heat. Add chicken; cook 4 to 6 minutes, stirring occasionally, until no longer pink in center. Stir in bell pepper, chiles, and onion; cook about 2 minutes longer or until onions just start to soften. Add taco seasoning mix and water. Simmer 3 to 4 minutes, stir frequently until slightly thickened. Transfer to a bowl and reserve. 3 In 4-cup glass measuring cup, mix milk and whipping cream. Return Dutch oven to medium heat; melt butter in Dutch oven. Add garlic; cook 30 seconds, stirring frequently. With a whisk, stir in flour and salt until smooth. Cook and stir until mixture is smooth and bubbly. 4 Gradually stir in milk mixture. Increase heat to medium-high; heat to boiling, stirring constantly. Boil and stir 1 minute; reduce heat to medium. Stir in cheeses. Cook until melted, stirring occasionally. Stir in pasta and reserved chicken mixture. Remove from heat. Pour mixture into baking dish. 5 Bake 20 to 25 minutes or until sauce is bubbly. Sprinkle crushed tortilla chips and green onions on top.